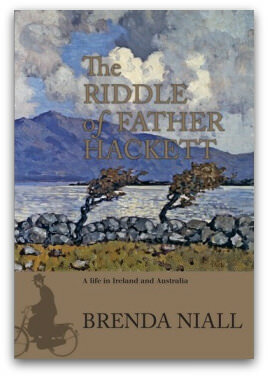 Brenda Niall, one of Australia's best biographers, has written a highly readable and surprising life of William Hackett (1878–1954), the Jesuit priest who was pressured out of Ireland to Australia in 1922 for his involvement with republican armed forces during the Civil War. Until now, Australian writers have remembered Hackett as the founder of a remarkable Catholic library in Melbourne. Niall adds to that memory an extraordinary range of fascinating context, colour and nuance. Growing up in the 1930s in what she calls the Catholic enclave around Studley Park Rd, Kew, in Melbourne's inner east, Niall first knew Father Hackett as 'a charming old man' who was a friend, and patient, of her doctor father. 'Hackett would take an armchair by the study fire and talk happily about books, people, places and ideas, enjoying a good cigar and scarcely noticing that the baby of the family, not yet walking, was expertly untying his shoelaces,' she records. A few years ago, when she began to consider writing a life of Hackett, Niall had the good fortune to discover that, soon after Hackett's death, Fr Doug Boyd had collected a remarkable set of letters and papers, all in one place, the Australian Jesuit archives. Letters between Willie and his sister Flo are a special resource in Niall's attempts to unravel the riddles of Hackett's personality and behaviour. This passionate biography mixes the private and political in an account rippling with insights into Hackett's family, friends and career as well as into some key events and people in 20th-century Irish and Australian history, religion and politics. There are excellent photographs including one of a letter to Hackett from Free State leader Michael Collins, one of the last Collins wrote. The result is a rare combination of personal memoir and public history. William Hackett was the fourth of nine children of a well-to-do doctor and his wife in Kilkenny, who sent several sons to Jesuit schools. He joined the Jesuits, adopted a generally austere and ascetical lifestyle, studied in Ireland, France and Holland, taught in Limerick and Kildare, and from 1915 on gave his energies to being a publicist for the republic. Then, most exceptionally among Jesuits, he supported the anti-Treaty side in the Civil War. By way of background Niall shows that Willie's father had, at some cost, taken Parnell's side against the hierarchy around 1890. Hackett supported the Irish army of national liberation in a number of ways. One of his activities discussed in this book is his attempt to stir consciences in England, for example, by taking Quaker visitors to sites of Black and Tan atrocities. This book contributes to the ongoing clarification of the bewildering events of 1916–23 in Ireland and their Australian connections. For instance, Niall sheds new light on key figures in the early 20th-century campaign for Irish independence such as Erskine Childers. Hackett was a personal friend of Childers, sharing with him clandestine activities in defiance of the British government; and, later during the Civil War, of the Irish Free State and the Catholic bishops. His letter to Mollie Childers after Erskine was executed by the Free State is one the book's gems, as indeed is the moving declaration of hope by Erskine junior sent to Hackett. For Niall, it is 'perhaps ... the gift of hope, which best defines William Hackett'. Niall identifies love of the Irish landscape and the Irish language as key factors in Hackett's increasing radicalisation. The latter brought him close friendship with Padraig Pearse and Thomas MacDonagh. In 1922 Hackett drew a sympathetic response from the order's leader for his plan for a new Jesuit school in which Irish would be the first langauge. Hackett's nationalism was of an upper-class bent and it occurs to me that, further to what Niall has recorded here, a key if mostly unnamed opponent in his life's work was the Catholic-Marxist republican leader James Connolly of 1916 fame. At the height of Hackett's republican involvements, the Jesuit provincial offered him at the age of 44, it seems, a choice of silence or appointment to Australia: he chose Australia. He felt some would call his leaving Ireland and its political struggle cowardice but he saw it as sharing 'in the anguish of Ireland's true sons by enduring death and exile'. In contrast to, say, the famous 1960s Colombian priest-guerrilla, Camilo Torres, Hackett chose obedience to his Jesuit calling above his political involvements. The second half of the book covers Hackett's three decades in Australia. After a short time in Sydney in late 1922, Hackett worked in Melbourne until his death at 75 in 1954 as a result of being hit by a car in Cotham Rd. From 1923 until 1934 he was based at St Ignatius parish, Richmond, during which years he concentrated on starting the library in the city. He then had a term as rector of Xavier College Kew (from which he was sacked by provincial John Meagher), and lived in Jesuit communities at Brighton, Hawthorn and Belloc House. At one point he criticised the philosophy of self-advancement that meant students at Xavier were 'making their way into the upper middle class on the back of the Jesuit vow of poverty'. Hackett had trouble managing finances and gave highest priority to his library work. Niall brings out the important and long-term impact of Hackett's founding and developing of the Central Catholic Library in Melbourne. She includes fresh information about the Campion Society and the emergence of the Santamaria movement. Hackett was the first chaplain to the Movement and Niall notes that, around 1949, Bartholomew Santamaria asked the Jesuits to appoint a replacement, which they did not do. Niall devotes a chapter to Hackett's friendship with Archbishop Daniel Mannix, some 15 years his senior, and reports Hackett's resentment at having to be 'the court jester' to 'the prince' during the older man's summer holidays. Niall quotes Mannix as calling Hackett 'a snob' but also as saying that Hackett was 'the father of Catholic Action in Australia' and that 'he was dear to me'. Reading between the lines of this section I was left with the thought that Niall would be well placed to write a future work on Mannix. The book also has a section on Hackett's friendships with three Australian prime ministers. Hackett liked Robert Menzies best and was pleased when he defeated Ben Chifley in 1949. This mention of Sion and Babylon is an echo of the ancient Hebrew poet and prophet Isaiah. Did Hackett, moving from the company of de Valera, Pearse and Collins to that of Santamaria and Menzies settle into the mindset of Babylon, with mixed feelings about its fleshpots, and, despite protestations of Irish radicalism, and forgetting Isaiah, make too much accommodation with Babylon? In the first decade of the Movement, while Hackett was chaplain, that organisation, in its enthusiasm to oppose the Communist Party of Australia, supported the Dutch in its war against the independence movement in Indonesia. Did the presence of communists in the Indonesia liberation forces blind Hackett to recognising in southeast Asia the same old story of empire, which he opposed in Ireland? From the founding of Belloc House in 1952, it took a couple of decades before Jesuit prophetic voices such as John Harte on Vietnam or Mark Raper on East Timor or Frank Brennan on Indigenous issues (Niall mentions him in her conclusion) would challenge the Australian establishment. Congratulations to the National Library of Australia for publishing this wonderful 320-page book with an elegant cover by Andrew Rankine. To me, the use of ragged right typesetting, extra paragraph spacing and no indent on the first line of paragraphs has given the text an uneasy or unfinished feeling. And, by the way, I see that in the introduction Jonathan Swift has wandered into the wrong century. Such minor criticisms aside, it is a fine and exceptional book. Val Noone is a fellow of the School of Historical Studies at the University of Melbourne. He recently edited Golden Years, a book about Father Golden SJ and the Newman Society of Victoria. The review notes well, 'Reading between the lines of this section I was left with the thought that Niall would be well placed to write a future work on Mannix'. Mannix has fared poorly from his many biographers - Cyril Bryan, E J Brady, Frank Murphy, Niall Brennan, Walter Ebsworth/Jack Kearney, B A Santamaria and Michael Gilchrist. Paul Ormond and Colm Kiernan are the only two who have added something worthwhile along with Vin Buckley's chapter on Cutting Green Hay and my few pages in Dreamer by Day. I still think the best is Jim Griffin's entry on Mannix in the Australian Dictionary of Biography. He also contributed one on Hackett. I anticipate Michael Costigan's contribution on Mannix will be incisive in his memoirs. As Vin Buckley says in ‘Green Hay’ the 1940 - 70s Catholic era has historically fared poorly. Noone’s own ‘Golden Years’ filled in gaps with wonderful prime source material. Michael S Parer 115 Rickard Drive Churchill 3842, Director Developing Cambodia by Degrees. Brenda Niall's book is in itself a revelation, as the best of history will often be. Both her work and Val Noone's insights promise a new gloss on what is not an old story but a continuing one. A noteworthy feature of the book is the clear way it deals with the period 1914-23 in Ireland, a minefield for many writers. Enthusing about the book to my friends, one of the things I tell them about Hackett is that when he was Headmaster of Xavier, he would instruct the senior boys on the correct way to smoke a cigar. I agree with Val Noone - an exceptional book. Val Noone's stimulating review leaves me looking forward to reading the biography. One of his comments condenses two eloquent voices. Weeping when remembering Sion echoes Psalm 137, which we cheerfully sung in the seventies - stripped of its bitter ending blessing those who would dash the heads of the enemies' infants against the stones. The Second Isaiah (Chaps. 40ff) is another voice from the experience of exile, offering - as Val suggests - a warning against settling too easily into the ways of the empire. Its remarkable passages also imagine a way of finding salvation that differs from the violence envisaged in the Psalm. Later, Gospel writers saw its figure of 'the Suffering Servant' as a figure of Jesus of Nazareth. I read this review with interest and I would like to buy the book. Where is it available? I became aware of Fr Hackett years ago when I was going through my father's papers after he died, and I found a note to him from Fr Hackett wanting to purchase our family's house, "Merton" on North Road, for a Xavier Prep School. Unfortunately, the purchase did not go ahead, maybe my great uncle was not ready to sell, but my father was very much in favour of selling to the Jesuits and he saw this as a way to preserve the property into the future. A most interesting read and well complemented by Val Noone's insightful review. Readers should note though, that Dean Swift's 'A Modest Proposal' was a protest against the famines of the 17th the and early 18th Centuries, it was published in 1729 [see page 14]. I found the Fr Hackett story rivetting. Having lent my first copy I found it passed through many hands and will now purchase another. It gave me something to add the BAS story. Well done! As Ibrahim waited for a taxi, he was attacked by four men who had been kicked out of a nearby club. Though severely injured, he continued to fight against his attackers. When police arrived, they sprayed capsicum foam in Ibrahim's face.